Battery and universal battery mount system. (Baldwin, NY -- Feburary 7, 2007) Series 7 introduces the next generation of DV powering systems with its innovative SL-50 battery and universal battery mount system. 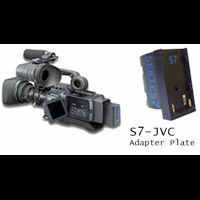 The Series 7 adapter mounts allow Canon/JVC/Panasonic/Sony camcorders to be powered from a single SL-50 battery. No longer do you need to have several different battery styles to power your various camcorders. The SL-50 itself is a marvel of technology and engineering. Using the latest in Lithium Ion chemistry and boasting a full 7A/50W capacity, the SL-50 is built around the same high quality cells that are used in Industrial camera battery packs. A 4 LED power gauge allows “at a glance” checking of remaining power with the push of a button. The charging system offers two “fast charge” options (single and double position). When linked with the SERIES 7 camcorder adapters, the SL-50 will power the majority of available camcorder in use today. The SL-50 enables users to enjoy significantly longer run times even when compared to optional Hi-Capacity OEM offerings.. For Sony users, the SL-50 is equipped with a compatible Infolithium® protocol that displays the remaining operating time. The BCL-1 single postion charger by SERIES 7 is an microprocessor based battery charging unit. The BCL-1 Charging unit provides one of the fastest charging speeds on the market, charging a single SERIES 7 SL-50 battery to full capcity under 3 hours. The unique all metal construction ensures that the BCL-1 will hold up the the rigors of ENG usage. The convenient 12v DC input allows the BCL-1 to be powered from numerous power sources. Waranteed for 3 years, SERIES 7 gurantees the highest quality and support with the BCL-1 single position charging unit.